Making badass weapons needs to have a certain degree of flair, so here are the best survival homemade weapons you should add to your arsenal! Bows will always be a staple on the list of most efficient weapons in history. Unlike guns, you can craft one on your own and it won’t garner too much attention. Make one yourself using these step-by-step instructions. You will also only need materials you may have now, such as PVC pipes and strings. Pepper sprays are for everyone. They’re easy to carry and are quite useful in protecting you when SHTF. This pepper spray is also one of my all-time personal favorites. Just spray one in the face of an attacker and make a run for it. This homemade self-defense weapon is easy to make, so check it out here. If you’re looking for a portable homemade weapon, then get one of these bad boys. This fits in your pocket and could also be a lethal weapon. Other than being a weapon, it also has a lot of uses to help you with your everyday tasks. It’s handy for all kinds of situations as well. You can also make and customize these DIY pocket tools to fit your specific need. You might also want to check out some other kickass self-defense tools right here! Pump Action Definition: It is a mechanism of forward-backward motion on a slider or lever to load the gun, fire it, and eject the empty shell. This inexpensive gun makes a great weapon because it’s still a gun when you have nothing else. It is a very useful item to have around when SHTF, indeed. It’s no rocket launcher, but it packs quite a punch and does pretty heavy damage. This DIY is simple and relatively cheap. In fact, the entire project, including a bunch of ammo, can be fabricated for around $20 only. Some people prefer using a taser gun or a stun gun when the going gets tough. Do you know you can make one on your own? Learn more about these homemade taser guns and their step-by-step instructions here. This tool is an absolute lifesaver when you find yourself stuck in the wilderness. When you have nothing else to protect yourself with, use this just like our ancestors did in the Stone Age! You may want to wear some gloves to give you a better grip on it so it doesn’t fly off your hands. A homemade bolt action 12 gauge is perhaps the closest you can craft next to a manufactured gun. This badass shotgun is enough to strike fear in the hearts of many an intruder. Who would dare make an attempt to antagonize you and your loved ones with these badass weapons? Other war hammer designs may be a bit more complicated to make. That’s because it requires some welding, drilling, and filing. This specific design is one of the homemade hand weapons that are easier to make, though. You need nothing more than a black pipe. It’s also a simple design, and the name says it all. Never underestimate the power of the war hammer! Sure, you may prefer the likes of a two-handed sword or an ax. But, this one is much more versatile. Should worse come to worst though, why opt for a hand-to-hand encounter when you can make it a lot easier on yourself? As you can already tell, this is one unique homemade weapon. The name leaves very little to the imagination when it comes to the destructive nature of this weapon. This saw blade Tomahawk is inexpensive to make if you have the all the right equipment and materials. This flamethrower will lay waste to anything that crosses its path. It will also fit in a normal backpack. With an air compressor, a diesel nozzle, a fuel tank, hose, and some fittings, you’ll complete a flamethrower! What I love about this homemade flamethrower is it runs on tiki torch fuel. It feels like living your video games fantasies making this one. This classic weapon will annihilate anything that comes its way. That is because the giant trebuchet packs a lot of punch. In fact, it’s one of the deadliest ancient weapons of war. It will catapult things with immense force. 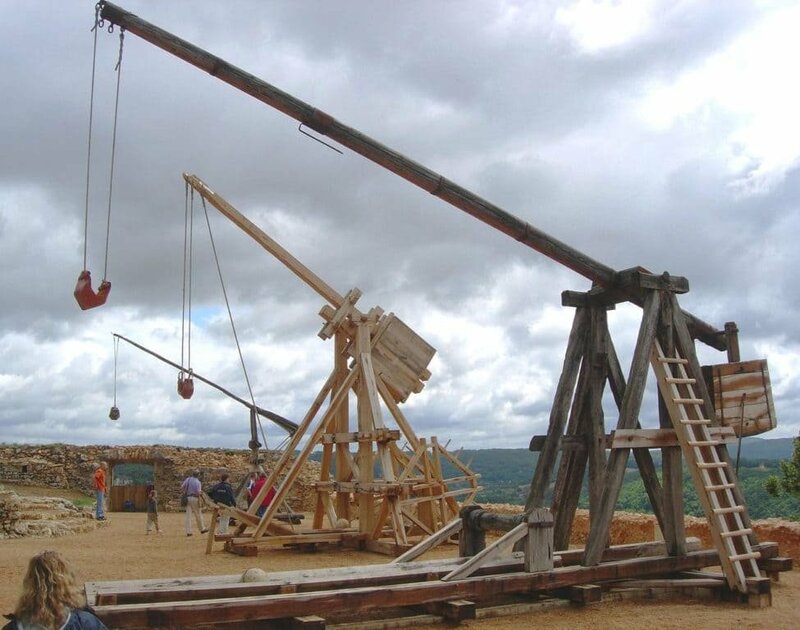 Follow the step-by-step instructions here to making a homemade trebuchet. Who knew an old lunchbox can become a weapon? You can use airsoft pellets for this. Since you’re making a landmine, practice extreme caution! You might be making this one for fun but things might go south for you and those around you. So take extra care when handling any kind of weapon. Have an old television around? You can turn it into something way cooler with a few steps. Read up on how to turn an old TV screen into a giant death ray! Find our step-by-step instructions here. Targets will never know what hit them once they get hit by this black pipe shotgun. It also has this twist, so here’s another video to help you create your own. In today’s world, your safety is something you can never be too certain of. Danger lurks in every street corner, every dark alley… even in the comfort of your own home. Knowing how to make some badass weapons is a plus because you can still defend yourself. You also don’t need to spend tons of cash to make one. Weapons, though quite useful, are also plenty of fun, especially when you can make them yourself. When SHTF and your resources are scarce, you’ll need a way to protect yourself quick. These badass weapons may not defeat a whole gang of thieves, but they’ll for sure come in handy when you need them in a jiffy. With these badass weapons you can make, you’ll not only have the protection you need but also a fun project to do. Which of these badass weapons do you like the most? Share your thoughts with us in the comments section below! Editor’s Note: This post was originally published on April 5, 2018, and has been updated for quality and relevancy.